May signals the arrival of the dreaded mowing season. After the low-maintenance period of winter ends (other than frozen water pipes), in walks the never-ending pressure to mow, weed-eat and edge the common areas, as well as attempt to get your tenants to do the same. So how do you get geared up for “mowing season”. The key is to get three bids before the season begins. We typically try to get at least one well-known mowing company bid, a lesser mowing company bid, and sometimes even the local guy that mows (who sometimes lives in your park) mowing bid. Then we compare them. It’s the old Sam Zell risk/reward scenario in full operation. You are obviously going to go with the well-known market leading mowing company unless one of the other two is substantially cheaper. Sometimes they are, and sometimes they’re not. Remember that anyone who mows your property must be fully insured, as all it takes is one rock blown out of that lawnmower to create thousands of dollars in potential damages. But here’s the good news: when winter approaches, the grass dies and you have 6 months to reflect on what went wrong and get ready to do it again (unless your park’s in Florida or California). The States With The Highest Number Of Mobile Home Parks: Representing Almost 50% Of All Parks In The U.S. There are around 45,000 mobile home parks in the U.S., and 49 states that have them (there’s none in Hawaii). So that means every state has about 900 parks, right? Wrong. Some states have huge numbers of them, but others have very few, such as Connecticut. So which states have the most parks, and what commonality is there between them? These are the states with the highest number of mobile home parks, as well as how many they contain. One of the first observations from this list is that the two highest population cities in America are in states that don’t have the highest number of mobile home parks. These cities, of course, are New York City and Chicago, which are #1 and #2 in total U.S. city population. Why is that? All we can guess is that both of these cities had high growth prior to the advent of the mobile home park era, which began in the 1950s and 1960s. Since Manhattan was already built out by the 1940s, there really was no room to build some parks. On top of that, the high cost of land in these two cities made anything less than high-rise construction uneconomical. It’s interesting to note that only Pennsylvania is located in the Northeast, although this entire region is hugely populated. The three biggest mobile home park states – Texas, California and Florida – are areas with high levels of retirees, as a result of moderate weather in the winter. Going back to the earliest days of the industry, the mobile home product (and the RV before that) was highly attractive to seniors who chose this style of living to downsize and flourish in retirement. Today, that demand is still going strong, and has been supplemented by extremely high housing costs that make affordable housing even more desirable there. It’s really interesting how diverse this list of top states is. There’s representation on all regions of the U.S., from North to South and East to West. Clearly, the mobile home park is a national treasure, as it has dominance throughout the nation. The only factor that really changes is the percentage of housing units in each region that are mobile home vs. stick-built. Many people think that mobile home parks are a product predominantly of the Southwest, but the truth is that this is clearly not the case. The top ten states for mobile home parks is a real shocker. The top three were obvious, but the balance of the list are not the states you would necessarily expect. On a long mobile home park drive, I will typically sample the main fast food emporiums. Although I try to stay on a diet of mostly salads, there’s no question that it’s hard to stick to that type of dining when you’re out in a town of 20,000 or in the middle of nowhere. So recently I went into a Steak N Shake, and had probably the greatest hamburger and fries in history. The coordination between the staff was amazing, and the product of their efforts was epic. So why was this Steak N Shake so darn good? I came in at the busiest time of the day. There were no tables available, and the drive-thru line was huge. So I got the last stool at the counter. I expected it would take 30 minutes or more to get served, but instead I had my food in maybe 10 minutes. How was this possible? Apparently, the manager and staff had expected to be this busy, and had started cooking massive amounts of hamburgers and fries before the crowd moved in. Dave Thomas, the founder of Wendy’s, called this concept “riding the wave” and it means pre-planning in advance for times of highest demand. And good mobile home park managers should share this same trait as you approach the 1st of each month. That’s when 99% of all rent collections begin, and the good manager should never be away from the office during this brief period, so every rent check can be turned in. We do not allow any manager to ever take a vacation between the 1st and 10th of each month, because of this. This Steak N Shake management team knew exactly what to give on and what not to give on. They were getting food out fast and letting cleanliness slack. You could see junk all over the floor in the kitchen as the focus was on fast food preparation and not on picking things up – that’s for after the crowd leaves. There was also the waitress rooming around with water and iced tea pitchers to keep the cups filled up. Good mobile home park managers have this same ability to focus on what’s truly important to customers – like fixing potholes and removing dead tree limbs – and not on the color of the flowers under the sign. The attitude of the staff at the Steak N Shake was stellar. Despite the fact that the restaurant was busier than a MASH hospital, the attitude was pleasant and professional. “Need some ketchup – no problem” was heard rather than “I don’t have time to get you some ketchup, sorry”. Every situation was oriented to the needs of the customer not the staff. As a result, you could not eat anywhere else. This is an equally important trait for park managers. If you treat the customer right, they will not be tempted to look at moving to another park, even if they can bet a lower price. Customer retention is just as important as a new move-in, and making customers feel valued is the first step to having long-term residents. Steak N’ Shake has great food. But this franchise was incredible. Everything was cooked to perfection and just the right temperature. The end result is that the customer knows that they are getting a great value – even if McDonald’s has a lower price. Many park owners fail to understand that the resident is not focused on just the lowest price – such Hillbilly Bob’s park down the street that has dirt roads and no skirting – but instead want to feel that they are getting a great deal, which includes a nice, safe place to live at a fair price. 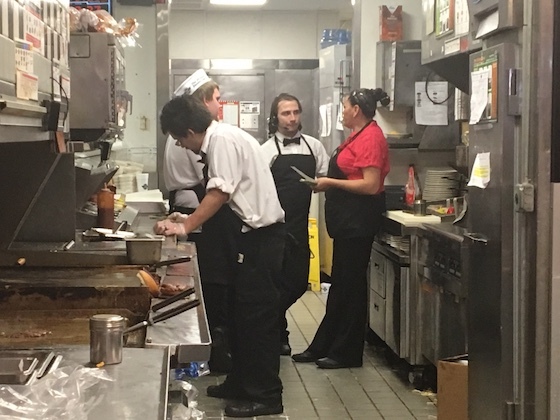 What was interesting about this Steak N’ Shake was that was that the staff were constantly huddling to share communication and strategize their next steps. It was kind of like a football team that was always reviewing the next play. This is a great concept for owners and park managers, which need to maintain a constant eye on the overall business plan. In times of crisis – such as this restaurant at rush hour – it’s not a bad idea for the owner and manager to talk daily, or even twice a day: once in the morning going over the plan and once in the afternoon reviewing the day’s events. It’s a shame that every mobile home park is not run as efficiently or successfully as this random Steak N’ Shake I happened upon on the road recently. If you ever get a management team this good, never let them go. And if you haven’t been to a Steak N’ Shake recently, you might want to give it another try. This is an advertisement for the 1929 Plymouth. The Ford Model A of that time period cost only $385 – which was 40% less than the Plymouth. However, according to Wikipedia “Plymouths were initially priced higher than the competition, but offered standard features such as internal expanding hydraulic brakes that Ford and Chevrolet did not provide”. Yet this car sold like crazy to the lowest earning Americans. And the lesson learned has a lot of validity for mobile home park owners. It’s hard for people to understand, but affordable housing success does not revolve around simply providing “cheap”. One of the first examples of this – although nobody ever knew it – was when the New York Times reporter lived in our property in Pontoon Beach, Illinois. He found that every single resident was extremely happy with the mobile home park, but what he didn’t know was that we had increased their lot rent 30% in tandem with cleaning up the property and re-paving the roads. The moral is that people don’t seek out simply the “cheapest” way to live, but instead want the best value. 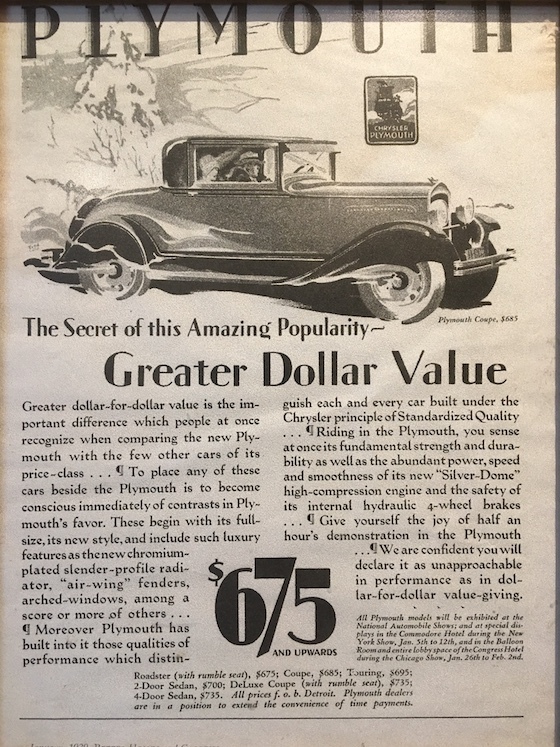 If you look at Plymouth marketing from 1929, you’ll see that every advertisement focuses on the benefits of the Plymouth product. Whereas Ford put their stock in price point alone, Plymouth was not ashamed to be more expensive because their cars offered much more to the customer. Park owners should do this same thing every time they interact with their residents. For example, when you send a notice of rents increasing, you should include with that notice a bar graph of the competing rents from nearby single-family homes and apartments to hammer home what a good deal they’re getting. You can never tell a customer enough what a good thing they have going – and they love to hear it! The reason that many park owners think that price point is all that matters is that there are a couple residents in every park that believe that. These are folks that drink the cheapest beer, shop at the local dollar store, and furnish their home with items from Salvation Army. While they have the right to live in any manner they choose, they in no way reflect the tastes and desires of the majority of your residents. When you raise your rent, do you always seem to hear a complaint from the same people? That’s because no matter what you do – pave the roads, clean out the debris, skirt every home – all they care about is dollars. When you really consider the source, you’ll realize that you are being bombarded with bad information from the same two or three people. Don’t let them affect your judgement. The average mobile home park resident is seeking only one thing: value not price point. Provide a great product and you can charge a higher price and still have a strong customer following. Charles Becker is the Duke University economist that is studying the mobile home park industry. His latest work examines lot rent levels in the U.S. and where they stand in relation to other forms of housing. This is a topic of great interest to every mobile home park owner, as we have all grappled with where to set our rents as well as having to justify our pricing when, in most markets, we are $1,000 per month or so less than apartments. This Lecture Series event is special in that it marks the official release of this important research as well as a discussion of its key points and Q&A with Charles Becker. Keep an eye out for the details in the coming days! 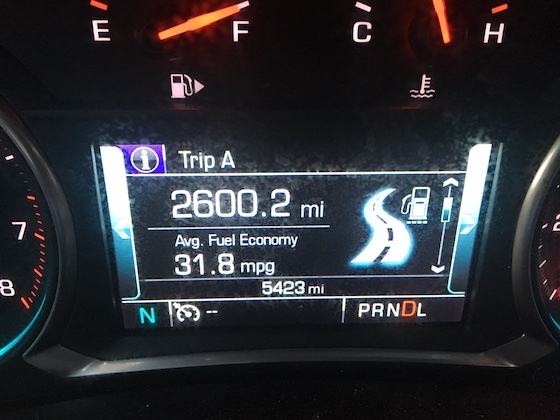 This is the actual trip record for a rental car I kept for three days – driving over 900 miles per day. I visited about 20 parks on that drive, and it’s something that I do frequently. So what are some trips on driving parks to get the maximum return on your time? When you’re in the field, you often get this feeling that you’ll remember everything when you get home. The truth is that you’ll forget almost everything within a few days. As a result, it’s essential that you take plenty of photos and take plenty of notes so that you do not tax your memory. I also recommend that you summarize each drive back at your hotel room each night, while the memory is still vivid from earlier in the day. You can learn a lot from your competition. Drive their parks every time you get into town, and see what’s going on. Did they fill lots with a bunch of RVs? Did they bring in some new homes to fill vacant lots and, if so, what age and size and what’s the price on the banner out front? We have learned some significant strategic items from competitors over time, and changed our business model accordingly. Markets are always changing and adapting, and you’re foolish if you don’t constantly tough base with the competition to see where you fit in. Drive the surrounding town with as much interest as the park itself. Look for clues as to market conditions, such as anchors shutting at the mall, or maybe survey stakes for a new development near your park. Remember that real estate is all about location, location, location. If you start getting concerned about the health of your market, it may be time to sell. However, if you see new things being built, it may also trigger the desire to try harder to buy more parks nearby. This is huge: never tell you manager that you’re coming in. If you do, they will deliberately stage things to look like they are doing a great job when really it’s the one time of the year in which they mow the grass and pick up the litter. While there is a slight risk that your manager will not be there that day, it’s worth the gamble to catch your employee completely off-guard and seeing what really happens when there is nobody looking over their shoulder. If you own a mobile home park in a large metro – such as Dallas or Houston – you will soon learn the necessity of doing your driving during any time except rush hour. In most cities, I find that the traffic gets insane between about 4 PM and 7 PM. Since you don’t want to arrive in the dark, that means the goal should be to arrive in the mid-afternoon. Plan your travel accordingly, and work backwards to see what time you have to leave to get there before rush hour. I caught in traffic in San Antonio recently that was so severe that it took me an hour to travel only 9 miles. That’s an insane waste of your time. Many people know that I have a hobby of collecting antiques. What many people don’t know is that I developed that hobby to entertain myself during long hours of driving (I’ve driven over 2 million miles during my business career). I have found that it is very unhealthy to sit in your car for more than an hour or two without walking for about 10 minutes. Antique stores give you that necessary break and are conveniently located along the highway about every hour or so. But you can replace that activity with something else of your choosing, whether it’s walking museums or walking malls. Driving parks you own is a periodic necessity. Although getting HD videos from your manager should be a monthly or quarterly exercise, there’s nothing that can replace the face-to-face information gathering of driving your property and surrounding market to see where you stand. MSN recently proclaimed that the world is ending because the default rate on mobile home loans has gone up from 3% to 5%. Their argument was that mobile home owners have not benefitted from the current economic “boom” and that if you can’t get by with a cheap mobile home mortgage, then how can you possibly survive in a modern America. The current delinquency rate for single-family homes in the U.S. is around 5% -- that’s exactly the same as the new mobile home delinquency rate. We’re not sure where the writer got their figures for the stick-built s. MH comparison chart, but here’s what we found on Google from a reliable source (the Mortgage Bankers Association). So we’re not sure what the point of the article is. There’s no reason why anyone would expect a mobile home owner to have less delinquency than a stick-built homeowner. On top of that, the writer points to the fact that 3-in-5 mobile home owners are having trouble paying their bills. That’s exactly in-line with stick-built home consumers, so I guess the message is that mobile home owners face the same financial strain as brick home owners, which would come as a surprise to just about nobody. Remember that 70% of all Americans – from McMansion households to flat-roof trailers – do not have $1,000 in cash. So if the writer’s point is that America is currently an economic wasteland, then I guess we all have to admit that. But mobile home owners actually are doing better than most Americans in other housing venues, and the writer missed that point entirely. Single-family mortgages are typically large, with the median home price in the U.S. standing at around $200,000. All of these mortgages are properly reported to the credit bureaus and are managed by professional lenders. However, most mobile home sales are used homes that sell for as little as $1,000, and these mortgages (or installment sales) are never reported. So the data the writer is using is strictly new mobile homes from the factory. Those new homes have an average mortgage of around $35,000 and are not representative of the greater whole of mobile home mortgages in effect in the U.S. – only the highest and most risky. 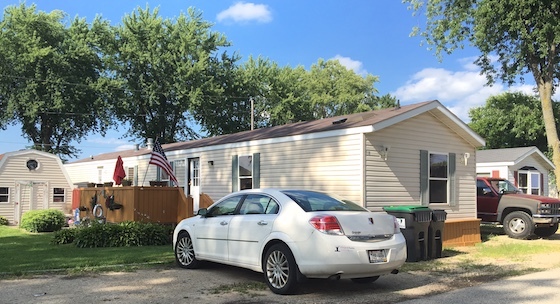 It is estimated that 50% of all new mobile homes sold in the U.S. are to mobile home park owners who elect to have them shipped and sold in their properties using such programs as Clayton’s CASH program. 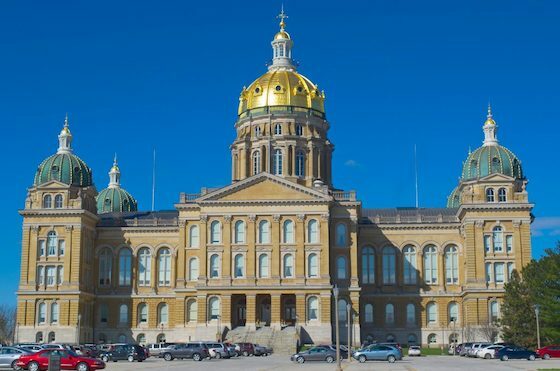 These programs have produced a huge win/win for the industry, as they provide needed affordable housing and homeownership to households that would not qualify without the park owner’s participation. However, we all know that there is a greater likelihood of some of these borrower’s defaulting because they do not have the greatest credit scores (which is why the park owner’s participation is essential). Although it does not mean that there is any loss on the loan – and the park owner, in fact, has to clean it up and show it again for re-sale – the very fact that there is a growing number of loans for these residents will, of course, cause an increase in defaults. We would note that the defaults in the absence of these programs were around 3% -- which is nearly half of stick-built homes – and even with these programs our industry is now simply in-line with all consumers. One big factor that the MSN writer missed is that by far the majority of mobile home owners have no mortgage. It’s estimated that 80% of the mobile home park residents in the U.S. own their homes free and clear. So the grouping that has an active mortgage to begin with is a very, very small percentage of the overall picture. 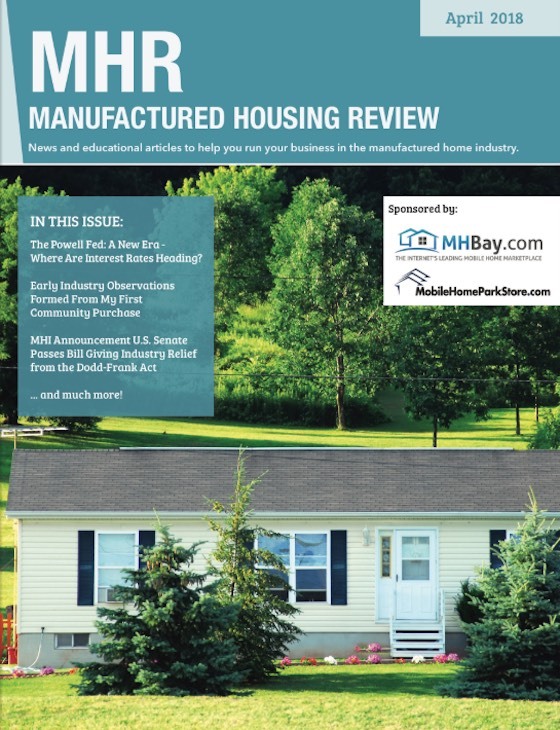 When the writer talks about 5% being a big number of defaults, the truth is that it’s more like 5% of 5% of all mobile home owners – and that’s hardly worth writing about at all. Today’s writers often use whatever available data they can find to try and support their article’s premise. It’s often called “fake news” but it’s also bad journalism. The MSN writer failed to paint an accurate portrait of the mobile home industry in its current state – but what can you expect from the same folks that bring you Myrtle Manor and Trailer Park Boys? The mobile home industry has suffered from more “fake news” for decades now. We often get asked what the perfect first deal would be for a mobile home park buyer. Well, here’s an example of one. It’s my old park in Lake Worth, Texas, just north of Fort Worth. There’s a wide range of reasons that this park had unique attributes that would make for a successful purchase. For starters, this property has a terrific location. It’s on the banks of a lake that has boat clubs and an inherently attractive setting. Since most Americans love lakeside living, this property has that winning feature to begin with. On top of that, Lake Worth has some great stats. The median home price is $104,20 and the average three-bedroom apartment rent is $1,249 per month. The housing vacancy rate is an incredibly low 5.53% vs. the U.S. average of 12.45%. And the metro population is 7,102,800. There really is not a single negative stat on Lake Worth that I’m aware of. We love to buy parks that have a poor cosmetic condition going in, as we can traditionally get really good prices and then fix the problems relatively inexpensively. Although overgrown grass looks like a huge issue to most people, it’s really not a big deal to fix. The same is true with such items as rusted fencing, debris in yards and those type of factors. In this case, I was able to buy the property for an insanely low price because it showed really, really poorly and scared off most potential buyers who could not see the vision through all the clutter. This property – despite a rough appearance – had just enough customers to cash flow from day one. And that was at a ridiculously low lot rent with plenty of room to increase, and some vacant park-owned homes that could be brought on-line relatively quickly. The worst type of parks are those that lose money every day starting at the closing, and puts you in a bad position of racing the clock to stop the hemorrhaging. I bought this property for about $4,000 per lot. Yes, that’s crazy. But the owner (who was in his 80s) had completely lost interest in it and simply wanted to be free of the responsibilities. The combination of the low purchase price, the ability to raise rents and fill vacant homes and lots, and the spectacular location made this a deal with amazing upside and potential from day one. Pretty much a sure thing to do well with. What also guaranteed this deal’s success was the fact that it has 24 lots and that is just large enough to propel it into the minimum deal size for most lenders. Since buyers never pay cash, really the integral part of making a park valuable is the ability to attract aggressive lending. While tiny parks just won’t interest most banks (who reason that it’s easier to make an identically-sized stick-built home loan). So once I made the necessary turn-around, I was assured substantial enough deal size such that the next owner (or refinancing) could tap into a large pool of banking options. What really made this deal extremely attractive on the front-end was the fact that it came with seller financing. That allowed me to buy it without the stress of having to find a bank (that would have surely freaked out over its terrible cosmetic condition). Seller financing gave me an even greater comfort level that the deal would do well, and saved me from any type of banking pressure until I got the turnaround completed. I cosmetically cleaned the property up immediately following closing. I removed debris from every lot, and demolished a few of the worst abandoned homes (one even had a large tree growing through the middle of it). I mowed and edged the entire property, and sprayed roundup on the weeds growing in the concrete. I installed an attractive entry sign. I painted and fixed the skirting on any home that needed it (whether I owned it or not). I renovated the vacant homes and sold them off. And I bought some new homes to fill vacant lots, as well as convinced mobile home dealers to send customers my way. I eventually filled all 24 lots. In the meantime, I increased the lot rent by about 100%, and the residents were still thrilled since I made them proud again of their community. And then, once I got it done, sold it for a multiple of the original price. All-in-all, a textbook good deal. There is no perfect deal. However, there are some that have everything going for them, and very little risk. It is those type of deals that make for the perfect first park, as they give the buyer a huge amount of buffer in the event of any rookie error, and do not require exemplary management skills. Can You Survive Master-Metered Electricity? One of the greatest challenges in buying a mobile home park is coming to terms with the utilities. While city water and sewer, and direct billed electricity and gas, is the norm in most parks, there are also parks that have situations in which the park owner is effectively the utility company. And one of these types is called “master-metered” electrical, in which the park owner pays the power bill for the entire park (and in so doing basically serves as the power company). So how can you approach this type of deal? Unless you are an electrician, you have no business doing the diligence on a master-metered power system. You need a quarterback who can lead you to victory – and you’re not it. Don’t try to nickel-and-dime this diligence or you could get in real trouble. Unless you know how to measure amps, then you are not the right person for the job. While there are many things you can do an exemplary job of in diligence on your own, this is not one of them. You’re going to start off with having the electrician figure out roughly how any amps the system is having to handle at peak power draw. This is the combination of all those air-conditioners, televisions, light bulbs, everything. And you may need to extrapolate this by physically counting the number of A/Cs and roughly how many amps each home needs. Let the electrician do this, not you. Now you’re going to have the electrician figure out how many amps the existing wiring and equipment can handle. The differential between this potential and the actual power load is what determines the health of the operating system. In addition, you will need to have the electrician do a complete study of every component to see if it needs repair or replacement. It’s not easy diligence and you need to really like the deal a lot to be worthy of this much time and cost. 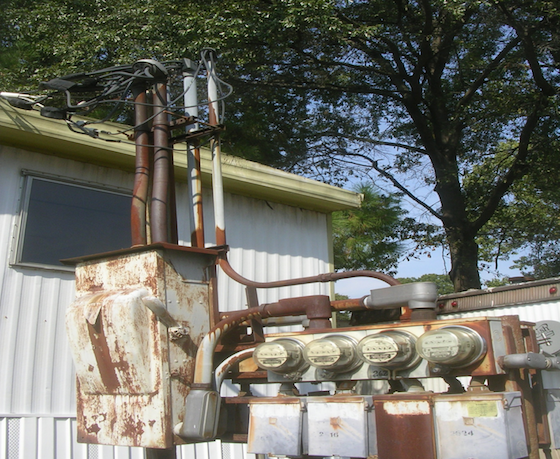 Some cities and counties (and even states potentially) have rules regarding what you can and can’t do to repair and replace a master-metered electrical system. We have seen systems that are blockaded from upgrades due to the city’s threat to yank the grandfathered status if such work was completed. You will have to work on the system from time to time and you need 100% surety that these repairs are allowed. There’s one other issue that’s worthy of discussion. And that’s the fact that, since you are the power company in a master-metered power system, you are also responsible to read the meters, bill them, and collect on them for each resident’s usage. Not only is that a whole lot of extra work, but the amount of power money your residents spend is vast and really adds to your collections risk. Nobody likes master-metered electrical systems. But there are good things about some parks that far outweigh this inconvenience. But make sure to do exemplary due diligence on such systems and let a licensed electrician be your guide. A vacant lot is worthless. An occupied lot can be worth $10,000 to $100,000+. This basic principle is what motivates every park owner to try and find a way to fill every vacant spot. Here are ten different ways to fill a vacant lot, with some observations on the cost and difficulty association with each. This is one of the simplest way to fill a lot, as RVs are not very demanding as far as power requirements or lot finish-out. You can simply put out the word that you take RVs and start filling lots almost immediately if the demand is there. It costs the park owner zero out of pocket. However, there are basically two problems with filling lots with RVs. The first is that many cities don’t allow RVs to be placed within mobile home parks. The second is that RVs can pull out at any time, and this lack of financial barrier is a real turn-off for future buyers and lenders. In this venue, you have an existing mobile home owner in somebody else’s mobile home park pull out and move over to yours. It costs you about $5,000 since you typically pay the full cost of the move. The great thing about these is that the customers is already a homeowner and you have extremely high retention. The downside is that if you do too much of this, other park owners may retaliate and steal your customers and you will have gained nothing. OK, here’s a wild one. Rent the vacant lot to the next door neighbor. This gives that neighbor a double lot, and you get a little extra money (typically $25 to $50 per month) but more importantly don’t have to mow the lot anymore. It also creates a happier customer with higher retention. There’s no real downside except for the fact that you rented the lot for a fraction of what it’s worth. There are people who are acting on the business model of the late Lonnie Scruggs and his book “Deals on Wheels”. They basically buy, sell and rent mobile homes inside other people’s mobile home parks. Its not a business model that we care to speculate in, but it does fill vacant lots and that’s great. Find the Lonnie dealers in your market and see if they will start putting homes into your park. The only downside is that, if you let one person own too many homes in your park, they may start blackmailing you for lower rent or they’ll pull them out. A mobile home in a dealer’s lot is not too compelling. But it’s a whole lot more saleable when you couple that home with a location and a turn-key offer to exchange keys for cash with an immediate move-in. We’ve done this successfully many times and it’s a total win/win. A simple model that requires little up-front cost and really has no downside. This program is offered by 21st Mortgage and it offers the park owner the ability to fill vacant lots with zero out of pocket, with 21st Mortgage offering the financing. It’s a great way to fill vacant lots, and there’s no real downside to it except for the fact that the park owner has to agree to cover the mortgage in-between residents and to clean and market the home if the customer defaults. The big observation here is that this program does not work in every market and park, as it requires potential residents with decent amounts of liquidity for down payments and decent (but not spectacular) credit. In this scenario, you buy a used mobile home, bring it in to your vacant lot, rehab it, and then sell or rent it. The downside is that there is significant capital needed for each step, and a whole lot of work, too. This is the classical way that park owners used to fill lots and it seemingly always works – but the other methods are a whole lot more fun and cheaper. An observation here is that you should try not to inject huge amounts of capital into old homes. When possible, buy newer ones that are more desirable and bluebook at higher amounts if you want to refinance them through 21st Mortgage or another lender. The alternative to buying older homes is to buy newer “repo” homes from the mortgage companies. These homes are traditionally 1990s and newer, and feature updated designs both on the inside and outside. Customers love them and they require much less work and risk. 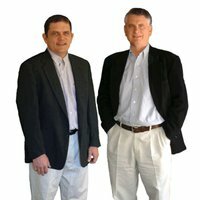 You can find lists of repo homes on such websites as MHBay.com. These are people who buy used and repo homes on the cheap, do a little patching on them, and then sell them to park owners. The nice thing about these is that you know the home can be transported and they typically have the title in hand. The downside is that there’s a mark-up and you could have bought the home cheaper yourself. That being said, there’s no question that this is a valuable source of homes in every market. No discussion of filling lots should come without a lecture on the importance of retaining the customers you have. It’s far easier to keep a customer in their home and lot than have to do any of the above-discussed options to fill a vacant lot. Treat people fairly and offer a great value and they will ever leave. Don’t forget that. To maximize the value of most mobile home parks, you have to fill vacant lots. As you can see, there’s a variety of ways to do it, each with its own strategy and issues. Select the ones that are right for your community.